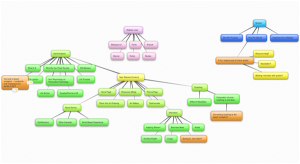 Mind Mapping with Bubbl | Welcome to Prints on Purpose! A number of years ago, a colleague introduced me to the practice of mind mapping. I created a couple of mind maps using paper and pen, but found that I ran out of space before I ran out of ideas. And the computer-based mind mapping program that she shared with me totally overwhelmed my somewhat tech-challenged self. You can create an account on bubbl.us and generate up to three mind maps for free. Or you can pay a modest monthly fee and generate as many mind maps as your innovative brain can produce. You can share your maps with your contacts of choice. You can allow those contacts to ‘read only,’ or you can give them the ability to collaborate with you by making additions to your map. This non-linear format can be a great resource for ‘right brainers.’ The tool allows you to take all of those marvelous ideas swirling in your head and capture them in one convenient place. And it’s fun! Now — do you have a favorite organizational tool you'd like to share? This entry was posted in General and tagged Mind Mapping, organization on July 30, 2014 by Donna Mills.